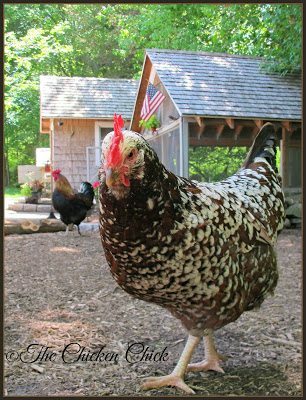 Hardware disease is a seldom-discussed health risk to backyard chickens, but it’s a serious, potentially life-threatening concern to bear in mind. 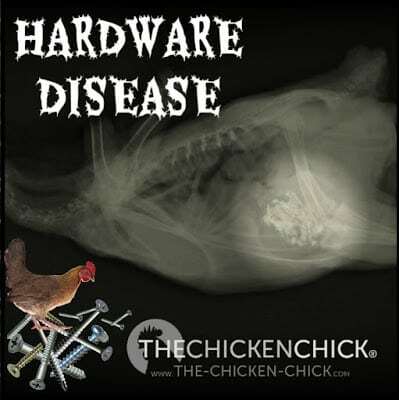 The term, “hardware disease” is a misnomer because it’s not a disease at all, but rather a description of various health complications that can result from chickens eating screws, nails, staples or other metal pieces found in the yard. Hardware disease is more aptly named traumatic ventriculitis, but that’s just not as memorable, is it? Viewer advisory: graphic post-mortem photo of a chicken’s gizzard below. 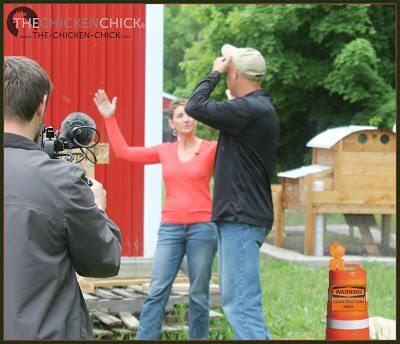 During filming of the new chicken reality show, Coop Dreams recently, I spotted a wood screw in the grass where coop construction was ongoing, which afforded me the opportunity to discuss hardware disease with the new chicken-keeper, Brad. The shiny find in Illinois reminded me to check my own chicken yard in Connecticut for similar items, which turned up quite an array of hazards in the fire pit ashes. Screws and nails found in the fire pit ashes. Not good at all. 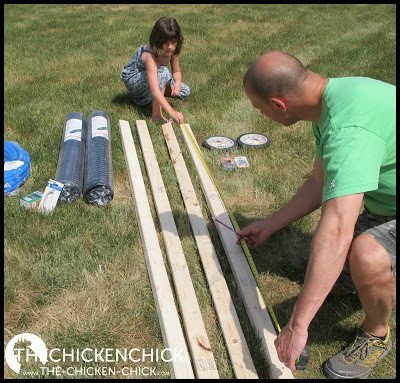 Raising chickens is a lot like raising toddlers in many ways- we must constantly be vigilant about things within their reach that may end up in their mouths. 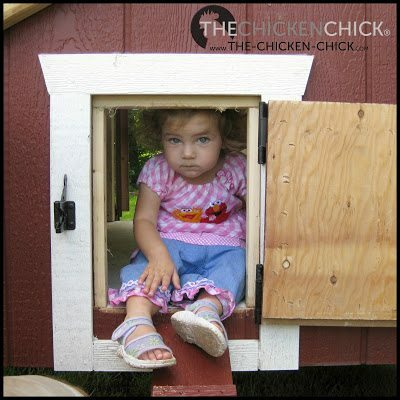 Thankfully, children grow out of the phase, but chickens never do. Shiny bits of metal on the ground are attractive to chickens who, without the benefit of teeth as a screening device, simply swallow sharp metal objects. The metal objects pass through the digestive tract where they can cause lacerations, perforations and infections. A chicken’s gizzard consists of strong muscle tissue that grinds up food with the benefit of grit (sand, pebbles, etc). 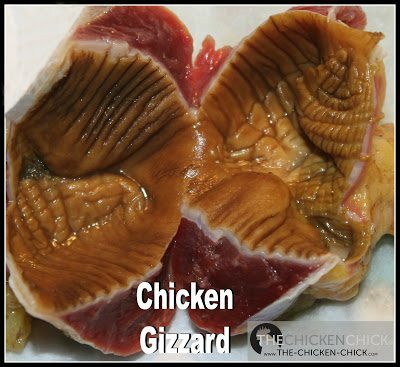 When nails or other hardware enter the gizzard, the grinding motion of this muscle can cause a lot of damage to the gizzard, which then creates an environment ripe for infection. Most chickens that die from hardware disease do so as a result of septicemia (aka: a blood infection or sepsis). An x-ray can detect hardware in a chicken’s gizzard, but without symptoms of illness or an injury, no x-ray is ordinarily taken of a chicken with hardware disease. Surgery is technically possible, but usually too risky to be considered a reasonable option. 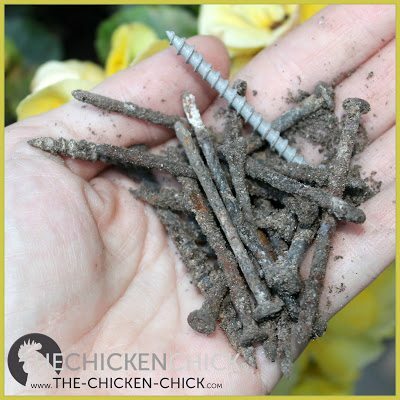 When using hardware in the chicken yard, pick up any fallen nails, screws, staples and bits of hardware cloth or chicken wire. 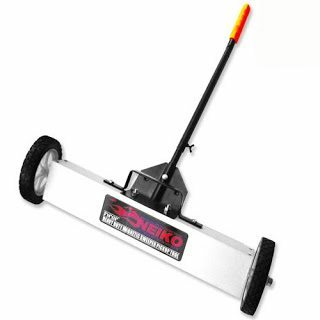 Use a Magnetic Sweeper pickup tool before building a coop and during or after any construction project. Metal pieces are frequently found in baled straw and hay, 1 opt for a safer bedding option such as sand. I’m glad to hear it turned out the way it did!